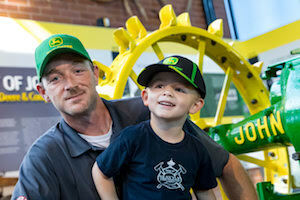 The John Deere Pavilion welcomed its four millionth guest, Kurt Snow, who celebrated the milestone with his three-year-old son. The John Deere Pavilion, which initially opened to the public in 1997, celebrated its four millionth guest recently when Kurt Snow, from Streator, Ill., walked through its doors. Pavilion officials were on hand to celebrate with Snow, who has deep connections to John Deere. As soon as Snow entered the Pavilion with his three-year-old son, he was greeted by Pavilion officials and presented with a gift package. Snow and his son received a variety of John Deere gear, as well as a gift certificate to be used at the John Deere store. Snow says he intends on visiting again in the near future, but he hopes to bring his entire family the next time he comes to the facility. The John Deere Pavilion has been one of the top attractions in the Quad Cities and state of Illinois since it opened to the public in 1997. It is open to the public year-round.